Stocksbridge Park Steels' scorer Brodie Litchfield tries to find a way past Spalding's rearguard. Credit: Gillian Handisides. But Stocksbridge Park Steels saw a crucial two points slip away as fellow strugglers Spalding United grabbed a stoppage-time equaliser in a 1-1 draw at Bracken Moor. Lincoln had the ball in the net midway through the first half when a free-kick was turned in at the far post but the goal was ruled out for offside. But Lincoln did edge in front five minutes into the second half. Adam Kelsey did well to parry a shot, but Kallum Smith reacted quickest to knock in the loose ball. Gavin Smith’s side through weren’t behind long and just before the hour mark, James Gregory hit a tremendous shot through a crowded area that Marc Newsham diverted past the Lincoln keeper. Sheffield went close to taking all three points late on only for Lincoln to scramble the ball off the line from a corner. But it’s now 13 points from the last 15 available for a resurgent Club. Stocksbridge will be kicking themselves for letting a crucial three points slip away against Spalding United. Steels had enough chances to have wrapped up the points long before Conor Marshall pounced from a stoppage time corner to earn the Tulips a point. Frickley Athletic slipped to a fifth league defeat in six going down 3-2 at home against Pontefract Collieries after they had led 2-1 through a Sam Cable brace. Buxton won 1-0 away at Stafford Rangers thanks to a Alex Young effort four minutes into the second half, but Matlock Town were well beaten 5-0 away at South Shields. Hallam stretched their unbeaten Toolstation NCE League run to 12 games with a resounding 4-1 away win at Worsbrough Bridge Athletic. The Countrymen got off to a perfect start when Kieran Watson volleyed home at the far post with just five minutes gone. The visitors certainly made the better start creating several chances before Watson finally extended the lead just before their half hour mark, tapping in Sam Smith’s low cross. Reece Treasure used his pace to get away a find the bottom corner with a neat finish to make it 3-0 on the stroke of half-time. Worsbrough threatened a comeback when Jack Waldren pulled one back three minutes after the break as Hallam failed to deal with a long throw. The Countrymen though wrapped up the points with the fourth on 67 minutes, Niall Smith with a peach of a cross for Sam Smith to head past the onrushing Briggers ‘keeper. Penistone Church remain second despite losing back to back league games for the first time this season, after going down 4-1 at Staveley MW. Joe Pugh got the ball rolling for the Trojans tucking away a 25th minute penalty after Sam Finlaw had been brought down. Pugh scored his and Staveley’s second two minutes into the second half with a left foot drive into the roof of the net.. Tomas Poole made it 3-0 on the hour after being cleverly set up by Matty Davis. Ryan Johnson gave Penistone a glimmer of hope converting a cross from substitute Reece High to pull it back to 3-1 on 72 minutes. However, Staveley made sure of the points with five minutes remaining, Robson Doolan coolly rolling the ball under the ‘keeper after getting in on goal. Maltby Main edged pasty Hemsworth MW 1-0 in a tight game at Muglet Lane, Danny Swales’ close-range effort on 76 minutes proving the difference between the teams. Worksop Town look to be over their recent little blip as they made it back to back wins with a 3-0 victory over Albion Sports at Sandy Lane. 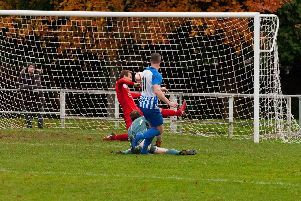 Ten-man Swallownest came from 2-0 down at Division One leaders Campion to draw 2-2, and Dronfield Town made it four wins from a five match unbeaten run by beating promotion hopefuls Selby Town 3-1 at Stonelow Road. Parkgate grabbed a late winner to come away from Ollerton Town with the spoils from a 3-2 win, but Harworth Colliery conceded twice in the last ten minutes to slump to a disappointing 2-1 home defeat against fellow strugglers Skegness Town. Armthorpe Welfare’s losing streak continued with a 4-0 home defeat against East Yorks Carnegie, while AFC Emley picked up a good point from a goalless draw at promotion chasing Grimsby Borough.